I'm Ed Smith, a Sacramento Degloving Injury lawyer. A degloving injury occurs when one or more layers of skin are removed from the body. This injury can range widely in severity but also has the potential to adversely impact someone’s quality of life. It can also occur when it is least expected, so it is essential for everyone to understand the basics. Read on to know more about this injury, including what it is, and what diagnosis and treatment options are available. A degloving injury derives its name from the type of trauma it describes. Someone who has experienced a degloving injury has had a significant portion of their skin removed from one or more parts of their body. For example, someone who has suffered a degloving injury of their hand could have one or more layers of skin removed from their hand. This could be the palm, the back of the hand, or even a finger. A serious injury could remove the skin from all of these surfaces. A degloving injury is not just limited to the hand. Someone could have a degloved leg or foot have the skin removed from their pelvic region or anywhere else on their body. The size and location of the degloved area will dictate the severity of the injury, the type of treatment that the patient might receive, and the patient’s prognosis. There are many different ways that someone could potentially suffer a degloving injury. All of them are traumatic in nature and lead to a force that pulls on the skin while leaving the tissue underneath the skin in place. This stretching of the skin over the stationary tissue underneath detaches the skin from its connection with the rest of the body’s tissue. When this connection is severed, the degloving injury occurs. While almost every active sport has the potential to cause a degloving injury, the risk while rock climbing is particularly high. For example, someone who reaches up for a rock and fails to get a secure grip could have their hand scrape off of the side of the rock. This scraping motion could lead to a degloving injury of one or more fingers. The risk is higher if someone gets their wedding ring stuck on a rock while the rest of the hand slips. Furthermore, a rock climber could get their finger or hand stuck in their gear and cause a degloving injury while pulling their hand to become unstuck. Undoubtedly, auto accidents are another place someone could suffer a degloving injury. 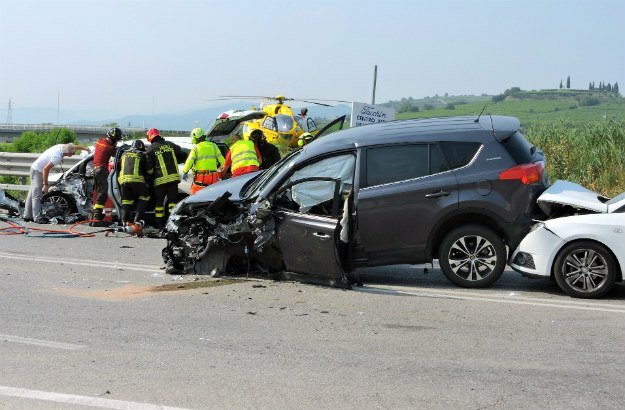 A serious accident could throw a driver or passenger from the vehicle, causing a degloving injury among numerous other traumatic injuries. If someone skids along the pavement at high speed, their skin could get stuck to the pavement as the rest of their body careens along the road. This could lead to degloving injuries on numerous parts of the body. Everyone should make sure to wear their seat belt to prevent being thrown from a vehicle and from suffering this type of extremity trauma. A motorcycle accident can lead to a degloving injury through similar mechanisms. A rider could think of a degloving injury as a form of severe “road rash.” When a motorcycle rider has an accident or falls from their motorcycle, they skid along the pavement at high speeds. This causes degloving in a manner similar to that described above. Make sure to wear protection overexposed areas of the skin to guard against this injury. People can also suffer a degloving injury while at work. Most injuries that occur in this manner are from people working in the heavy industry. Forklifts, augers, and power tools can catch someone’s exposed skin if they aren’t paying attention. Employees could also get a limb stuck in a piece of equipment. This could lead to the limb being fractured, shattered, or degloved in the process. Everyone should make sure that their equipment has been properly maintained. Finally, everyone should take the necessary safety precautions to guard against an injury that could potentially end their career. There are numerous types of degloving injuries that people should be aware of. 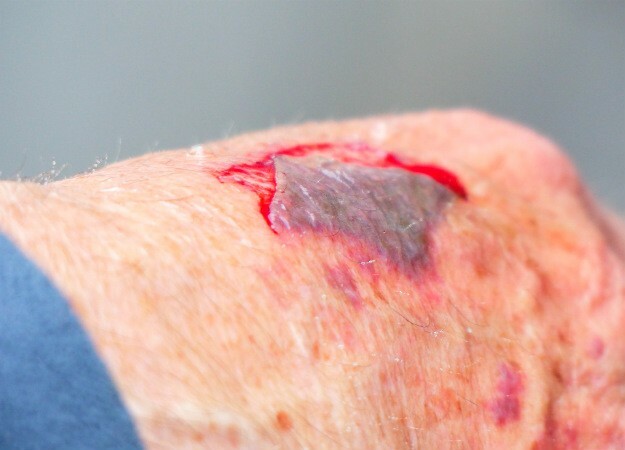 An abrasion degloving injury is the removal of a patch of skin from a single site. This can be viewed as a superficial degloving injury; however, this doesn’t mean that it isn’t serious. While only one plane of skin has been removed, this still has the potential to be a large injury. A large abrasion can lead to severe pain and blood loss. These injuries still warrant the immediate attention of a medical professional to prevent a serious infection from developing. In contrast to the abrasion described above, a circumferential injury removes the skin from a limb on all sides. View this injury as someone removing a sock or stocking that used to encase their entire lower leg. Instead of removing an article of clothing, the skin is removed in this fashion. In general, these injuries are more severe than the abrasions described above; however, a circumferential degloving injury can also range in its size and severity. For example, a circumferential degloving injury of a finger is going to be different than a circumferential injury of a thigh. It is also important to note that degloving injuries can be classified based on their depth and the number of layers that have been degloved. A shallow degloving injury may only remove one layer of skin from the surface. On the other hand, more severe injuries could remove multiple layers of skin or even some of the subcutaneous tissue from underneath. A degloving injury is typically diagnosed using the clinical picture alone. The doctor will ask the patient a few questions about how and when the injury occurred. They may also ask about the patient’s symptoms, when they developed, and perform a routine physical exam to ensure that other areas of degloving are not missed. A clinical diagnosis means that lab tests and advanced imaging are not usually required to make the final diagnosis; however, they could still be used to diagnose the severity of the injury and to look for other associated issues. For example, a physician could order a blood draw to ensure that the patient has not lost too much blood from the injury. If they have, a blood transfusion might be in order. The doctor may also order an x-ray or an MRI scan to check for associated bone fractures, muscle tears, or nerve injuries. It is important to get the entire clinical picture before proceeding to the treatment process. Depending on the severity of the injury, the first step is clinically stabilizing the patient. Undoubtedly, patients will have lost blood after a degloving injury. A patient will typically receive IV fluids to improve their blood pressure and hydration status. Patients who have lost a significant amount of blood may require a blood transfusion. Most patients are in severe pain and will receive some sort of pain medication to treat their symptoms. The exposed areas of skin will be wrapped in sterile bandages to stop the blood loss and prevent an infection from developing. Some patients may receive antibiotics as a prophylactic measure to guard against developing infections. After this, the patient may be taken to the operating room for treatment. While the size of a degloving injury will vary, most patients will require plastic surgery to place a skin covering the area that has been injured. Sometimes, the skin that has been degloved is still attached to the rest of the limb. In this case, the skin could be replanted over the surface tissues. This is an advanced surgical procedure that could also require revascularization of the blood vessels. This will restore the flow of blood to the skin, hopefully keeping it alive. In some cases, the skin may no longer be viable. In this case, a larger skin graft could be required from another area of the body. The surgeon will need to make sure that the skin has been fully attached to the tissue underneath. There is also the possibility that the tissues underneath the degloving injury have been so severely damaged that they cannot be saved. In this case, the patient may require an amputation to prevent the dead tissue from damaging the healthy tissue around it. When a patient has suffered a degloving injury, it can appear extremely gruesome. It is challenging for a surgeon to tell how a skin graft will look immediately after it has been applied. The body needs time to accept the graft and heal the area that has been injured. It could take some time for the patient to truly understand how the graft will look. Once this process has been completed, the patient may need to visit a plastic surgeon who might be able to make some of the graft look more aesthetically pleasing. They could remove any “dog ears” from the graft site, spread the subcutaneous tissue out to give it a more even appearance, or, possibly, redo some areas of the graft to improve the coloring. Finally, patients may require routine ultrasound scans that will ensure blood is flowing to the graft and facilitating the healing process. 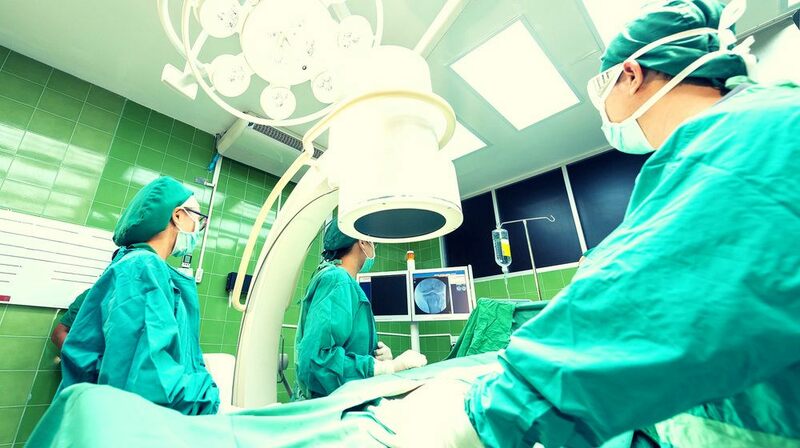 There are numerous complications that a patient has to be aware of with any degloving injury. Unfortunately, infection is common with any degloving injury. The skin is the body’s first and largest barrier to infection. When this has been removed, the body loses this defense against infection. This means that it is much easier for bacteria and viruses to colonize the injured area. Patients can develop severe infections that could require inpatient antibiotics treatment. As with any traumatic injury, the patient could lose a significant amount of blood. Patients who have lost a large amount of blood could have their blood pressure drop, their heart rate rise, and could pass out. Physicians will treat blood loss with IV fluids and, potentially, a blood transfusion. Severe degloving injuries could lead to life-threatening amounts of blood loss that require emergent treatment. Some patients will suffer from some forms of depression following the injury. Due to their appearance and slow return to baseline functioning, patients may feel a lack of confidence that makes it difficult to carry out daily activities. Patients should focus on their rehabilitation, which might be required to restore function, and ask for the support of their family and friends during a challenging time. The patient’s prognosis must be taken on a case-to-case basis because these injuries can range in severity. If the injury is small and superficial, the patient could be left with only a scar. A severe injury could damage the tissues underneath and limit the motor and sensory function of the limb. The most severe degloving injuries could result in an amputation of the limb itself. Because of the wide spectrum, patients should speak with their physician about the prognosis of their individual case. I’m Ed Smith, a Sacramento Degloving Injury Lawyer. If you have suffered a degloving injury in an accident, please call me at 916.921.6400 for free, friendly advice. Look me up in the Million Dollar Advocates Forum. We represent a group of experienced accident lawyers who have been listed alongside some of the top trial lawyers in the United States. As members of this selective group, we have all won case verdicts or settled cases worth over $1 million for our injured clients. Some of my verdicts and settlements can be seen here. Be sure to read some of my client reviews on Avvo, Yelp, and Google. Suffering from or seeing a loved one suffer from a degloving injury is one of the most difficult situations you'll experience in your life. Because this is a high-risk injury, urgent medical treatment is always a must to help the patient recover faster. But, to avoid this from happening to you or a loved one, extra care should be observed at all times.